The Law Society's Archives contains a small, bound volume containing a few items collected by Henry Scadding, a Toronto historian and clergyman in the 19th century. Included in the volume is "A Simcoe Relic" - a short journal with sketches contained in a letter written by Elizabeth Simcoe, the wife of John Graves Simcoe, the Lieutenant-Governor of Upper Canada. Elizabeth Simcoe (1762-1850) is well-known for her writings and drawings documenting life in Upper Canada. 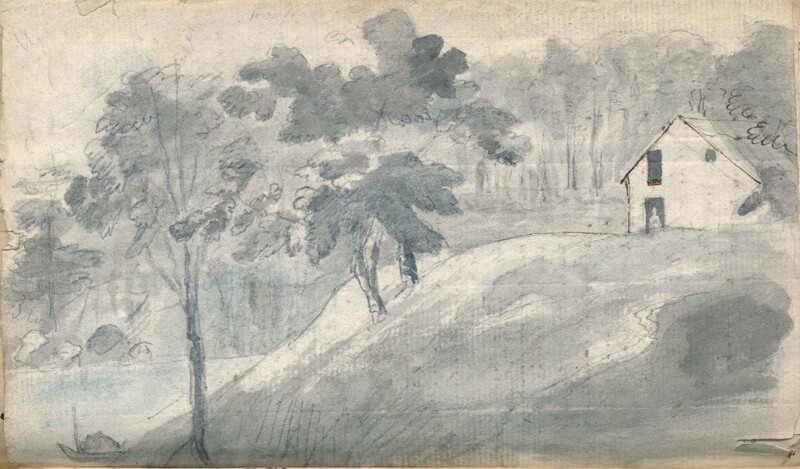 The journal entries and sketches were recorded by Mrs. Simcoe while on a boat trip from Kingston, Upper Canada, to Quebec in September 1794. Mrs. Simcoe and her children travelled to Quebec because of the possibility of an American invasion of Upper Canada. View a scanned copy of A Simcoe Relic. Law Society of Ontario Archives, Henry Scadding collection, “A Simcoe Relic”, 991051-001.